Our article focuses on affordable DIY headboard ideas and how to make a bed headboard from scratch. We also included the cost of materials! There are countless ideas when it comes to making your own headboard. And since it doesn’t require a lot of materials, the skill level needed is quite low. A homemade headboard is one of the easiest DIY projects there is, and it all starts with a little bit of imagination. If you have a lot of extra materials already, then this is a fun way to make use of them. Like any easy project, this one can become hard without a little bit of information. So make sure you’re prepared from the start to avoid any hiccups during the build time. After looking at some of the fabulous project ideas online, making a headboard might seem like more trouble than it’s worth. No matter how extravagant the look, the real work comes down to research. Don’t make it a habit to get halfway through a project only to realize you’re missing key information. It’s mandatory to have lots of space for building a headboard, even if it is for a children’s bed. Low experience with tools is fine, even if you undertake a big project. Building your own headboard will save a lot of money, especially for owners of California King Sizes. If you already have most of the materials, then the price gets cut down more. Low experience in tools isn’t a problem as long as proper safety precautions are followed. DIY fans that took a single home economics class in school will be fine undertaking this project. You get to make a headboard that fits your personal tastes rather than buying a standard one. The created headboard will be unique from anything else you could ever buy. That means if you ever upgrade, it can be sold for a higher price than what you paid for the materials. Using your own materials guarantees that the created headboard will be more durable than a purchased one. There are no surprises about the quality of the materials in your DIY headboard if you only go with high end materials. Extravagant headboards will cost the same as branded ones if you don’t have any of the materials. Money is saved by at least having the base tools for the project. Parental supervision is needed when doing this project. Sharp and dangerous tools are used for the most important parts, so it’s recommended that children not be involved. Making a mistake with the cutting leads to an unusable piece. Experienced users will be able to salvage bad cuts, but it is still a hassle. The project can’t be completed in a small area, so if this is for an apartment then it will need to be done outside. Small homes with no backyard or garage will also need to look elsewhere for a workspace. Because of the noise level, some apartments will be even more restrictive during the project. There are a couple of materials that you’ll need for this project. Keep in mind that beyond the base materials, everything else is optional. 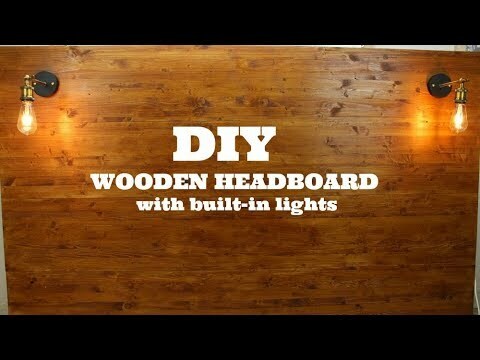 So if you’re not creating a headboard with LED lights, there is no reason to get a light kit. And if you don’t care about padding, then foam or pillows won’t need to be purchased. The below materials are the basic set to get the project off of the ground. Wood/Metal/Plastic – This is what the base will be made out of, and there are no restrictions on the material used. Technically this can be any material as long as it’s flush with the width of the bed. The most common is wood, with the cheaper plywood option available if you want to save money. Remember the overall durability of the headboard is heavily dependent on the base material, so going cheap in this department will hurt you in the long run. Wood also gives you the most flexibility with design without lowering the quality. Saw/Jigsaw/Circular Saw/Mitre Saw – You can go for the power tool or the traditional saw. To keep things accurate, a power tool is recommended to get the best cut. It should also be noted that using a traditional saw will make creating the headboard a hassle. Experienced users won’t have any issues, but inexperienced users should stick to power tools. There is also a speed bump with the power tools that makes them worth the extra cost. Pencil – Not a regular pencil, but one made for working with wood or other materials. For this product you can go mechanical or not, with the latter being the cheaper option. When in doubt, purchasing a #2 or #4 should do the trick. Some consider the #2 ½ the sweet spot, but personal preferences will lead you in different directions. Here is where the costs begin to come together. After figuring out the base cost, you can check out how much materials would be if you wanted to do something better than a base headboard. LED lighting can be added or reading lights attached. The tufted look can be added along with any color that fits your design specifications. Creative types can even add their own shelves, either open or with their own doors. Adding in these little extras will raise the price of the project, but even if you go all out you will still save money. A retail headboard of good quality goes for over a hundred dollars just for the basics. You can stay under a hundred dollars for a retail headboard by looking for good deals, yet the value of creating your own still reigns supreme. A better way to look at the DIY vs. retail cost is to think of how much it would cost for a high end headboard. Now you’re looking into the hundreds, factoring in all of the extras that make a product attractive. With a DIY headboard you can get all of the extras and spend half of what the retail version would be. The only big cost in all of this is time and convenience. Deciding to make your own headboard comes with its own challenges. Time, money and a firm commitment to finish will get you through the worst of it. Mistakes are a part of game, yet most of them you can overcome with careful thinking. Decide ahead of time whether you want a base headboard, upholstered or something with a lot of options. There are a lot of design ideas available online to get you started, and that alone makes it easy to transform someone else’s project into your own vision. A slight change to finished DIY headboards will keep you from having to do extra guesswork without sacrificing your creativity. Knowing what position the headboard will be in will decide what type of headboard you’ll create. A headboard against the window will make it harder to hang with the appropriate tools. It would be easier to make a standing headboard from the start than having to adapt after the project is finished. Even when going directly against the wall, hangers may not be the best option. Not all walls are receptive to hanging something heavy like a headboard. Check the placement before you start the project so that all important questions about placement are answered. Any material can be a headboard, so don’t limit yourself to just wood. Repurposing other materials will be no more different than handling wood. This is a helpful tip when you have unused materials around the home. It’s also possible to blend materials together into one, like adding metal to wood. Automated tools are preferred over manual ones for this DIY project. The price difference between the two isn’t vast, so there is little reason to go with a manual tool unless you already have one. Lining up a cut is a lot easier with an electrical saw, even if it is one of the older models. Should Headboard Weight Be Limited? Not really, unless you know for a fact the wall can’t handle it. The material used will be the main factor in determining how heavy a headboard is. The heaviest will either be metal based or pure wood. Both of these materials are heavy duty, built to last and can survive multiple moves without breaking. Even if you try to make a heavy headboard, you’ll still be way under the maximum limit that a normal wall can handle. Will Fusing Electronics With The Project Be Dangerous? If you’re not doing anything too complex, then no. Add light or an outlet to a headboard involves cutting a space for it and running a cord out through the back or sides. If it is battery operated, you can mount it without doing any cuts. There is nothing complex about adding electronics to a headboard when you account for the proper space, size and length requirements. The only thing to check for is exposed wire, which of course would be a hazard. If possible, try to plug cords into a nearby surge protector. During The Project What Safety Gear Should Be Worn? Users will be dealing with sharp objects and toxic chemicals. Gloves, a mask and safety glasses should be worn at various steps of the project. They are the minimum requirement for safety during the project. All of these products can be purchased for a couple of bucks together. They even sell the gloves, glasses and mask in a kit for under $5. Don’t use alternatives like dishwashing gloves since they don’t provide the protection you need. Prescription eyeglass wearers should also buy eye gear that is compatible with their glasses. Can This Project Be Finished In A Small Space? It can, but it’s not recommended. Whenever you’re cutting something, having space to maneuver helps with accuracy. Safety is also another reason why you wouldn’t want to do this project in a cramped space, with one wrong move guaranteeing an accident in such a small space. A backyard or garage is the perfect place for this type of DIY project. Apartment renters will have their options limited a lot more, so a little creativity is needed to get the job done. It isn’t out of the ordinary to finish the headboard in a friend’s/family members home and then transport it to your apartment. Ingenuity is the key in both the design of the headboard and its creation.